Happy Monday!! I hope everyone had a great weekend. 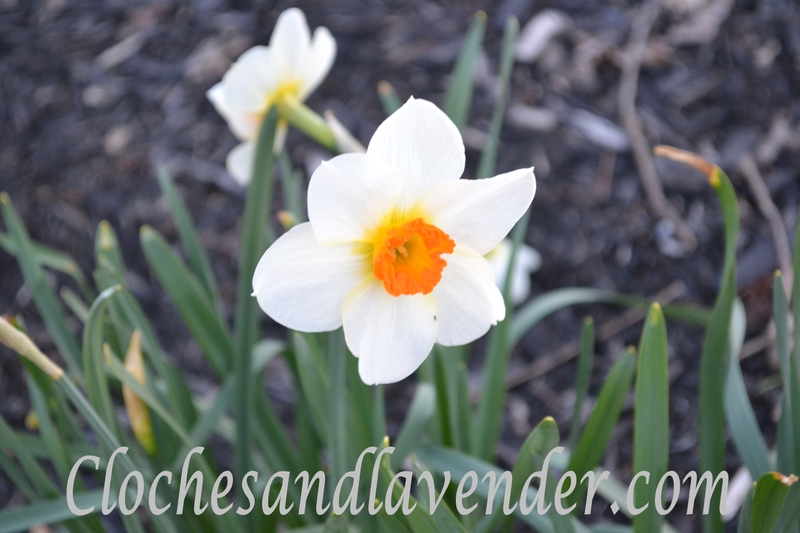 Spring has finally sprung here….the temperatures are still chilly but there is beauty everywhere. The sun was shining so brightly this weekend. I thought I would share some of our last spring at our home as time is drawing closer to close. I will be looking forward to planting more of these beauties in our new home! I love this picture with the sun just starting to set as it casts a beautiful glow. 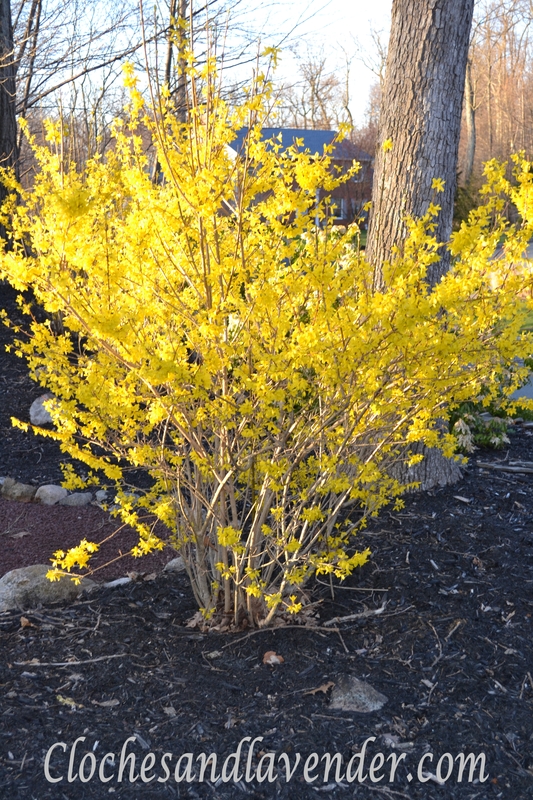 This bloomed Forsythia is stunning in all of its yellow glory. Our last spring here is opening a whole new life for our small family. The flowers look so beautiful! I love the pops of yellow and the Forsythia is incredible! Very pretty, Cynthia! We came home from our trip to see everything in leaf and all the bulbs flowering. Such a nice sight to see. It is warming up a little this week, but it seems to go up and down here. I’ll be glad when it just stays in the 60’s! Chilly here all week and I can’t wait for the 60’s either. So pretty, Cynthia. Love that bed full of daffodils!! Ours are starting to bloom, but the forsythia is still a week or so away. So happy spring is finally here!! It will be bittersweet for you as you prepare for your move. Thanks Heather and it will be bittersweet but an exciting beginning too! These are so beautiful Cynthia!! Thanks for sharing this last spring at your current home. This is all so pretty! I’m glad that you were able to get out and actually take photos of the final Spring glory in your yard. Those are photos you will be able to fondly look back at in the years to come. 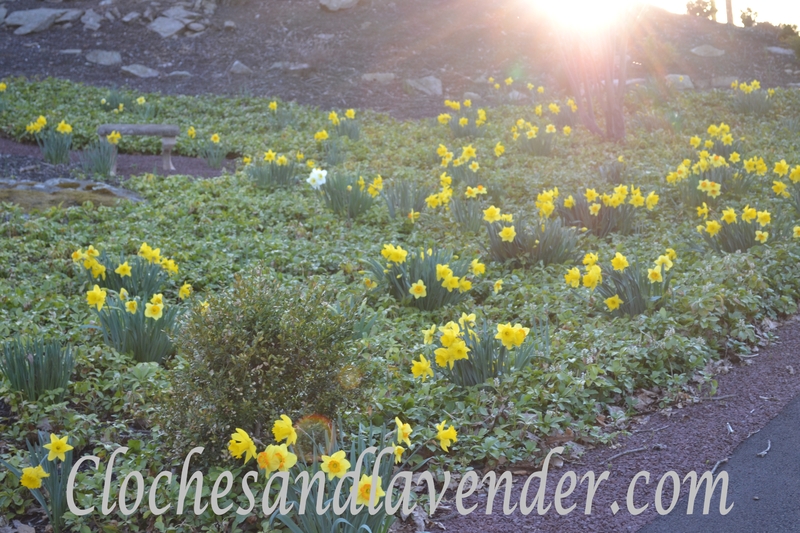 I LOVE the one of the sun shining over the daffodils!!! Beautiful photos though that Forsythia is just amazing. What a lovely sight to be able to feast your eyes on. Thanks so much, it is beautiful in our yard right now with all the yellow and white. Just beautiful! I am sure you will be able to replicate the same garden in our new home. This is our home now in our new home I will plant new bulbs. Thank you so much, spring took its time to get here. so pretty, cynthia:) i’ve never planted daffs, can you believe it?! they are so pretty! i know leaving such a lovely garden will be bittersweet. hope you are doing well! It is bittersweet but I will plant more bulbs in the new house. Thanks for stopping by. Very pretty! 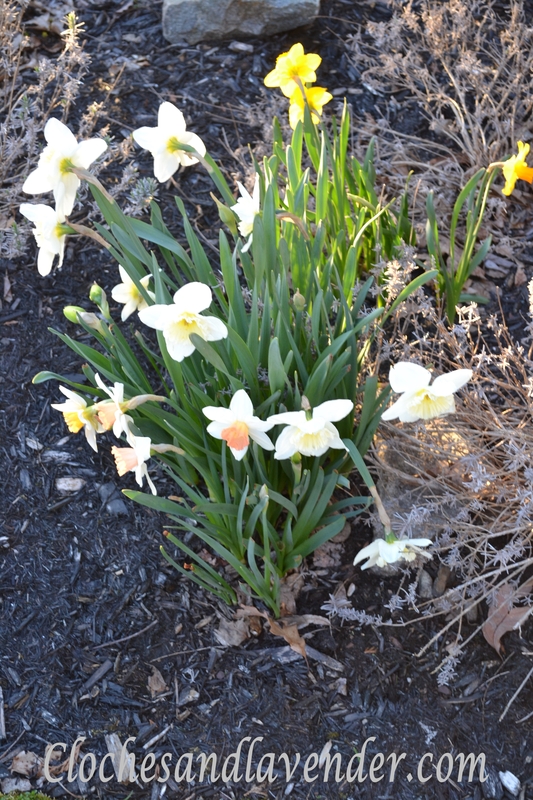 The daffodils look so bright and springy! Thanks, they are my favorite. 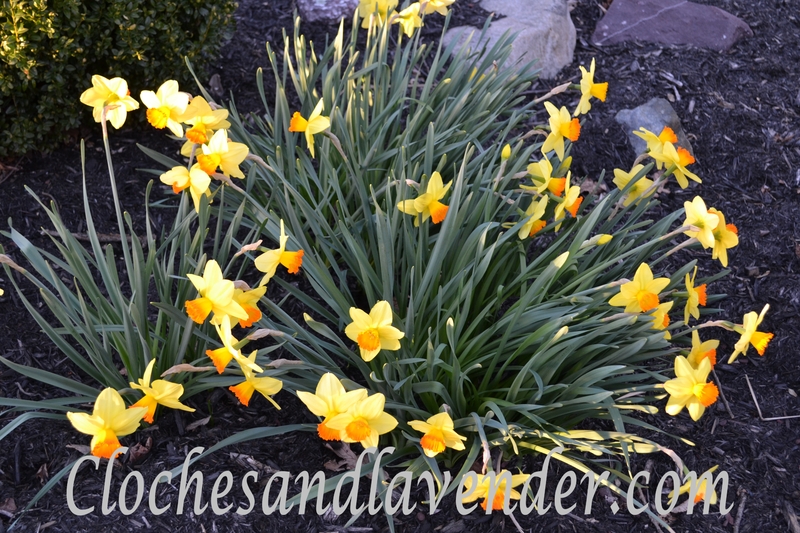 Your daffodils and forsythia bush are so lovely! Things are really looking “springy” at your place. I wish the temps would rise a bit. I agree, today may hit 70!!! 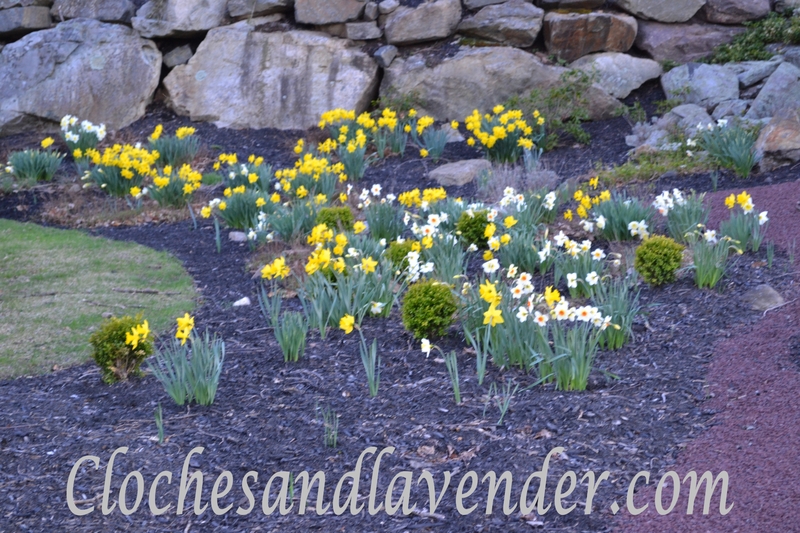 Daffodils and forsythia just smile Spring don’t they! So pretty! Oh so pretty, Cynthia! What lovely Spring pictures you’ve shared. Next year you’ll have more beautiful photos at your new house. That’s something to look forward to for sure. I’ve never planted daffodils, but then again, I ‘ve never planted much 😉 They are lovely! They are so easy just dig a hole drop the bulb in and cover with dirt. Just do them in the middle of fall when the ground is cooled. I love daffodils. Things are much further along here, but the temps are still up and down. I am very ready for the weather to stay warm. They are my favorite, we are in the 60’s now but it is still windy. Hope the temps pick up for you. I would imagine that it’s hard to leave. It’s so lovely. And there’s nothing cheerier, in my book, than daffodils! They’re my favorite, probably because they’re the first flower we see in our backyard in the springtime. They are my favorite too and I plan on planting them again. It must be a beautiful bittersweet time for you. You got some truly lovely shots of your garden to remember it by. I love all the sunny yellows!. They are my favorite and I am planning on planting varieties in our new home. That will be fun! 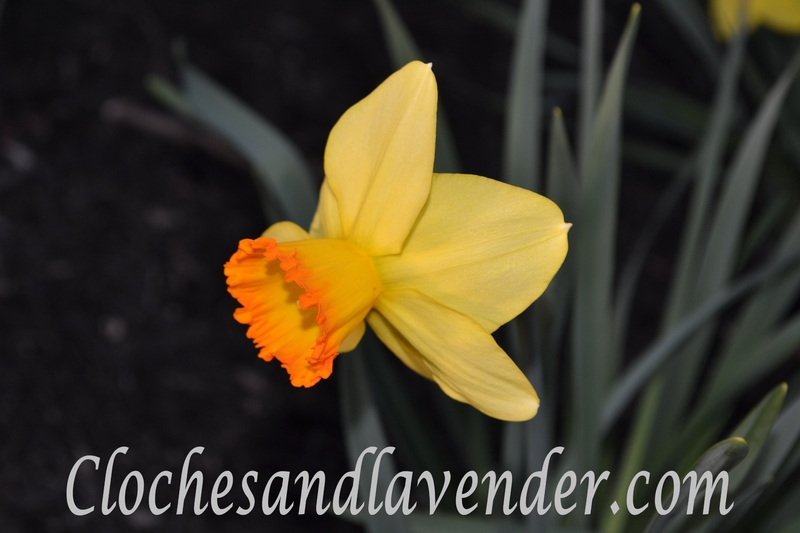 Beautiful Cynthia…I am sure that the new owners will have many years of Spring enjoyment that you planted!! They love all the daffodils. Cynthia, I know what that is like. We had that happen with our previous home. Our son was renting it at the time and ready to move out. It all worked out for the best because he got married and they bought the home. They love it and I’m so happy that it has remained in the family. Love the pictures! Home Goods never disappoints. I will be praying that the new sale goes through for you. Thank you so much, we are hoping everything goes smoothly this time. Such beautiful flowers, what a wonderful sign that spring is here! Hope you had a wonderful Mother’s Day!! What beautiful flowers, what a wonderful sign that spring is here! Hope you had a great Mother’s Day! I did and I hope you did too. Glad you stopped by.